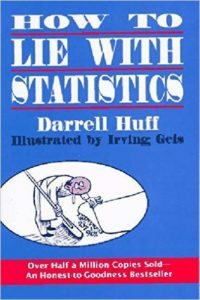 Darrell Huff’s book is about the long history of data deception. He explains the many ways data can be manipulated — to misrepresent facts, to tell a different story — in advertising, politics, and other areas and how to defend yourself from it. Statistics can be used to deceive. Data can be consciously or unconsciously biased — by the statistician or the source. A poor data sample is one of the biggest errors. A data sample is a small representative sample of a bigger statistical population. Huff uses an example of a barrel of red and green beans. Rather than count every bean to see how many red beans there are, you grab a handful thinking the red/green ratio in your hand is similar to what’s in the barrel. The sample needs to large enough and selected carefully enough or it won’t represent the whole barrel closely enough. A biased sample leads to conclusions no better than an educated guess, yet could still be seen as fact. Sources lie: polls and surveys come with an additional risk of bias from the source. The person being asked the questions can exaggerate their answers to make themselves look better or give the more pleasing answer – the answer they think the surveyor wants to hear. Being skeptical and giving some extra thought to how the sample might be biased is the best deterrent. Assuming the sample passes all the tests, it’s best not to view the results as perfectly accurate. “Average” has multiple meanings that can be used deceptively. There’s mean, median, or mode. In investing, there is the geometric average which is different from the arithmetic average. Taken from a series of numbers, each “average” can be different, to be misused based needs. In a normal distribution like the height of a population, you get a bell curve, with the mean, median, and mode falling close together. A skewed distribution, like income for a population, leans to the left or the right, producing an obviously different mean, median, and mode. A small sample size is easily manipulated and often hidden in plain sight (a reason to read the small print). Chance — luck, dumb luck — can have a big impact on the results in a too small sample. Flipping a coin should produce heads 50% of the time. Now flip a real coin ten times: 80/20 is just as possible as 50/50. Chance will have a bigger impact on 10 flips than on 1,000 flips. A large enough “flips” or trials are needed for the probability to be useful. Standard deviation — the range from average — is often purposely left out to oversimplify the average or give it the appearance of precision. It which case the average is useless. Standard error measures the accuracy in which a data sample represents a population. It’s presented as “± X”. The point of standard errors is to start thinking of results as being in a range, even if the standard error isn’t stated. The big mistake is believing results are precise when it really represents a range of probabilities. Charts and graphs are a convenient way to use data to exaggerate, deceive, or lie. Also known as chart crimes. Ignore all charts and graphs without numbers or measures on the X or Y axis. Watch out for line graphs that change the proportion between X and Y axis to steepen or flatten the slope of the line/curve. Beware of pictographs and bar charts that change width, height, and length but represent a single factor. It can give an exaggerated visual impression of comparison. Post hoc fallacy — “If B follows A, then A has caused B.” For example: if data shows that runners have a higher average income, it would be wrong to assume that running will increase your income. Yet, people come to that conclusion. In every case, there are many possible explanations why (like chance) and you can’t just pick the one that fits your opinion. Be ever watchful for the bag of tricks used to intentionally (or accidentally) distort statistical claims. The decimal point adds the inference of precision where it rarely exists. Percentages are no different. And when combined (like in finance taking percent to the nearest hundredth) it gets silly. Poor math using percentages — adding, subtracting, multiplying, dividing — should be added to the watch list. For example, combining a sales discount of 50% and 20% is not 70% off but 60% off. Another example: if your portfolio takes 50% loss followed by a 50% gain, you’re not back to even. You’re only halfway back to even. A 100% gain is needed to break even after a 50% loss. Who Says So? — look for conscious and unconscious bias. What’s the agenda? Do they benefit from presenting data in that specific way? Does it tell the entire story or a partial story (only the good or bad part)? Does it misuse average? Does it deceptively hide behind an “authoritative” name to back the claim? Does any number of biases – recency, overconfidence, confirmation, self-serving, sunk cost, hindsight, groupthink, etc. — come into play? How Do They Know? — look for sampling bias. Where did the data come from? How did they get it? Is it a representative sample of the population? Can it be biased in any way? Is the sample big enough to make a reliable conclusion? What’s Missing? — look for missing information that would make it more usable, thus trustworthy. Does it define the “average” being used? Is the standard error included? Is it raw data or percentages or both? Out of how many? Is a comparison or causal factor needed but missing? Did Somebody Change The Subject? — look for a subject change between the raw data and conclusion. Does the data show a rise in X or is it just being covered more often? Does the title/article/paper relay the results or is it a biased use of it? If it’s a census or survey, can it be backed up, disproved, or made more informed with secondary data or a little second-level thinking and is it? Again with surveys, do those answering stand to benefit (get hurt) by answering in a certain way? If its a comparison, is it apples to apples or apples to oranges? Is it a post hoc fallacy? Does It Make Sense? — look out for anything that fails the common sense test. Is it a complex, complicated thing reduced to a single number? Is the data presented in a range or as a precise figure? How many decimal points? Is it an extrapolation of a trend or a prediction of the future?